Above: Products used in this FOTD. Happy weekend, lovelies! Now that I am back home from my travels and nearly settled in, I am thrilled to share a fresh FOTD, featuring one splendid eyshadow palette, a new lip duo and a most magnificent jumpsuit...all converging on an extremely windy balcony. Above: The cumulative look...wind, courtesy of Idaho. For this look, I aimed to channel an early 1970's vibe...I took cues from the films Love Story and Shampoo to create a breezy aesthetic that is equal parts earthy and sophisticated. A mixture of four shades from the stunning *Visart Sultry Muse Eyeshadow Palette (also available at Sephora...line previously reviewed HERE and swatches below) blended to the brow bone...more on this brilliant palette soon! For lips, I applied a layer of the newly procured Kaplan MD Lip 20 Treatment in Peach (a beautifully glowy pale coral), topped with Kaplan MD Lip 20 Treatment Gloss in Candy Sparkle (a tender baby pink with lots of shine) for fresh take on a muted pink pout. I am loving the hydration lip fullness that these lippies deliver! I set the makeup look with the brand new *Koh Gen Do Silky Moist Foundation Powder in #123 (an exact match for my NC 25 skin)...this powder is incredible; good coverage, keeps oil at bay, looks like nothing on the skin, yet perfects everything you want it to. Full review soon! 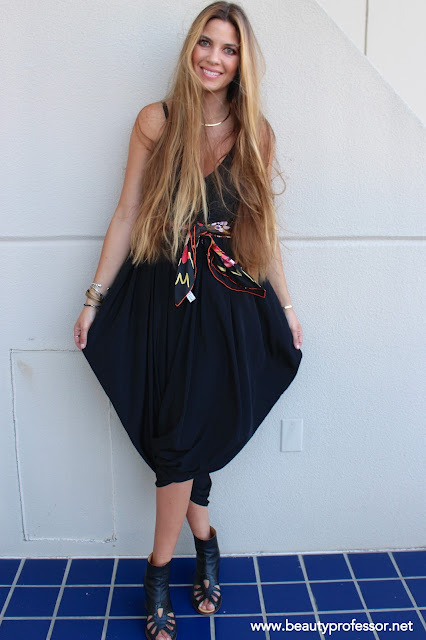 Black Harem Jumpsuit...I picked mine up at a random boutique in downtown LA earlier in the spring, but I found a similar version HERE. I have gotten so much use out of this versatile garment; it's comfortable, can be dressed up or dressed down and is perfect for warm weather! Ferragamo "Funny" Silk Scarf (as a belt). This brilliantly-hued Christmas present from my brother is permanently in my handbag as a belt, a chic disguise for a too-low top and a hair accessory...every girl needs one (or 10!). MM6 Masion Margiela Open Toe Wedge Booties...similar pair HERE. I have two pairs of peep toe wedges from this line and wear both constantly...such a marvelous investment. Above: The Viseart Eyeshadow Palette in Sultry Muse is all sorts of wonderful...the 12 shades provide endless warm, satin-infused looks. Here are the four hues I used for the eye look below. I am completely in love with the Viseart line these days! Above: The full eye look...a burnished rosy bronze with a delicate (read: NOT shimmery) sheen. Above: My latest lipmix from Kaplan MD...these moisturizing shades are subdued while instantly increasing lip fullness. What an auspicious discovery. Above: Candy Sparkle...baby pink well-executed. 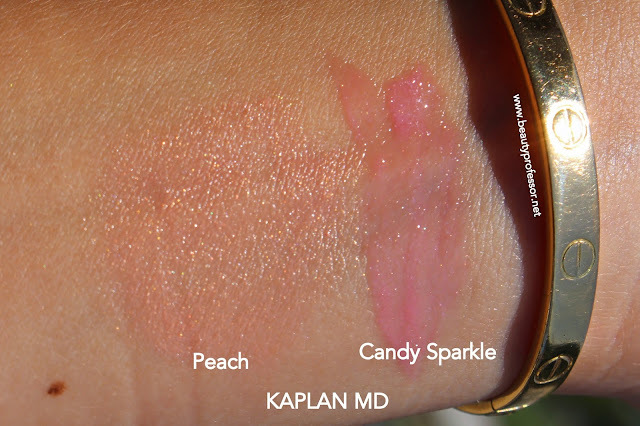 Above: Swatches of Kaplan MD Peach and Candy Sparkle in direct sunlight. The Peach lip color has a velvety smooth texture and a soft pearl finish. The Candy Sparkle gloss is plush and decidedly non-sticky...simply lovely! Above: The cumulative look, no flash. Above: The cumulative look, with a flash. Above: Lips are subtly present. Above: Windblown, with a flash. Bottom Line: I hope you enjoyed this FOTD and would love to know which products might have caught YOUR eye...Visart? Kaplan MD? Do you happen to love jumpsuits as much as I do? Good things ahead, including a Skincare Round II post, a haircare-centric piece, a travel feature and a host of fresh product procurements. I officially finish teaching for the summer next week and am working through your lovely comments and email as I attempt to wrap up the school year in a comprehensive and cohesive fashion. In the meanwhile, thank for your patience and support! You look beautiful, as always! I am so tempted by the Visearts palettes, but wish I could see them and play with them in person before I purchase one. I love your necklace! Who is it by? Thanks so much, Tatiana! I highly recommend the Viseart palettes...will be sharing complete swatches of the Mattes and Sultry Muse soon ; ) My necklace is by Charles Albert...it's a collar that I picked up while out of town!